Play-off hopefuls Luton held on for a goalless draw against Dagenham despite playing the second half with 10 men. Joe Widdowson went close for the Daggers early on but his header was cleared off the line by Paul Benson. 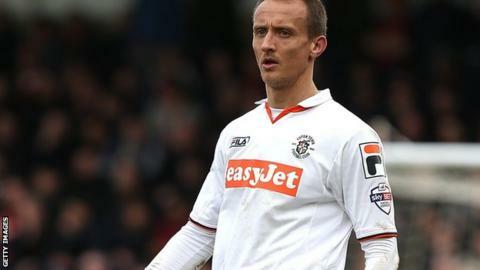 Luton, whose boss John Still was returning to former club Dagenham for the first time, saw Benson red carded for a high foot on Ian Gayle. Ashley Hemmings almost won it for Dagenham but his shot was blocked on the line by Michael Harriman. Since beating Accrington to go fourth in League Two in late February, Luton have been on a terrible run of form, having only won once in their last 10 games, including eight losses. Despite this, the Hatters remain just three points off the play-off places in eighth position. "There was no maliciousness in it (Paul Benson's tackle) whatsoever, he didn't even know where the player was. In defence of Dagenham's bench, they said it was never a sending off. "Honestly, I've given up on decisions this year, I really have. I just think we've had so many things happen that haven't fallen for us which, when re-examined, showed that they should have done. "We should have had a penalty, 100%, and that's from Dagenham, and then the sending off. "The boys have done fantastically, what's pleased us all we've conceded one goal in the last three." Match ends, Dagenham and Redbridge 0, Luton Town 0. Second Half ends, Dagenham and Redbridge 0, Luton Town 0. Corner, Dagenham and Redbridge. Conceded by Luke Wilkinson. Attempt blocked. Ashley Hemmings (Dagenham and Redbridge) left footed shot from outside the box is blocked. Corner, Dagenham and Redbridge. Conceded by Michael Harriman. Attempt missed. Jodi Jones (Dagenham and Redbridge) right footed shot from outside the box misses to the left. Attempt blocked. Jodi Jones (Dagenham and Redbridge) right footed shot from outside the box is blocked. Matt Partridge (Dagenham and Redbridge) wins a free kick in the attacking half. Substitution, Dagenham and Redbridge. Jodi Jones replaces Andre Boucaud. Attempt missed. Andre Boucaud (Dagenham and Redbridge) right footed shot from the right side of the box misses to the left. Attempt missed. Elliot Lee (Luton Town) right footed shot from the left side of the box is too high. Luke Howell (Dagenham and Redbridge) wins a free kick in the defensive half. Corner, Luton Town. Conceded by Mark Cousins. Attempt saved. Elliot Lee (Luton Town) right footed shot from outside the box is saved in the top centre of the goal. Attempt saved. Jamie Cureton (Dagenham and Redbridge) right footed shot from the right side of the box is saved in the top centre of the goal. Attempt missed. Elliot Lee (Luton Town) right footed shot from outside the box is too high. Substitution, Luton Town. Mark Cullen replaces Shaun Whalley. Corner, Dagenham and Redbridge. Conceded by Steve McNulty. Jonathan Smith (Luton Town) wins a free kick in the defensive half. Attempt missed. Jamie Cureton (Dagenham and Redbridge) right footed shot from the centre of the box is too high. (Dagenham and Redbridge) wins a free kick in the attacking half. Scott Griffiths (Luton Town) wins a free kick on the left wing. Attempt missed. Andre Boucaud (Dagenham and Redbridge) right footed shot from outside the box misses to the left.